IMFI BLOG - In a changing world, anticipation makes the difference. The world economic slowdown is badly hitting Europe. French universities are under the constraints of drastic budget cuts. The University of Angers does not escape this turmoil. 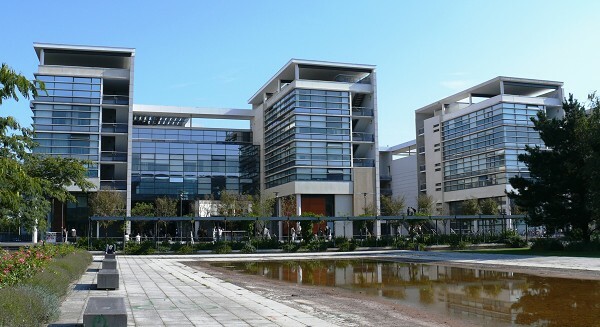 Despite the successful recruitment of international high potential students and the strong commitment of the International Faculty and the project Team, the board of directors of ISTIA decided, July 16, 2012, to cancel the opening of the International Master « Foresight and Innovation » scheduled for October 15, 2012. Considering the time needed to get a national agreement to deliver a diploma for a new programme, I have little hope to be able to offer you an alternative for this academic year 2012-2013. However, in a time of high disturbance, almost everything is possible. Thank you again for your interest in this Masters and sincere apologize for this unthinkable decision. 2. Expansion of Entrepreneurial Capitalism – Can expect intensification of national public policy rift (Status Quo Defenders vs. Venture Capital Enthusiasts); ever-greater Generational Divide and intense power struggle. 3. Tougher Competition from State Capitalism – Can expect Political Elites to increasingly use large and profitable State-run Corporations and massive Sovereign Wealth Funds to entrench their power and rig markets for political gain (China, Egypt, India, Russia, Saudi Arabia etc.) … major threat to strength of free-market principles and human rights. Undermines R&D and creativity. 4. Expansion of Personal “Bubble of Intelligence” – Can expect cloud empowerment from voice-aided Personal Intelligence Agent; 24/7 advice and support. Promotes factual equality-of-sorts, though lofts value of ingenuity. 5. Persistence of militant Islamic Terrorism – Can expect attacks from al-Qaeda and global jihadists; complicates our strategic pact with Saudi Arabia against Iran; assures a volatile Middle East, and oil supply uncertainty. Countered somewhat by unexpected rise of USA energy surplus (Natural gas/shale oil). 6. Expansion of Nanotechnology Uses – Can expect revolutionary materials and “robobot” delivery systems; capacity to alter almost everything!. THE next Great Revolution, though much remains to be learned (and safeguarded). We would love to have you participate in our continuing research on how we use our brains to handle change and create futures. 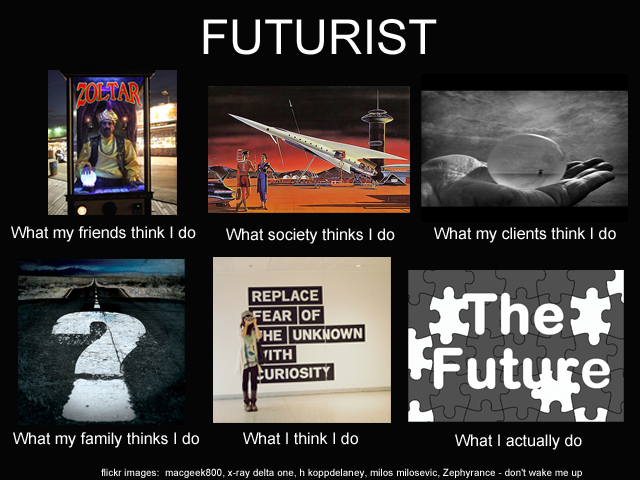 We love futurists and we also want non-futurists of all kinds (over 18 please) to respond to our alternative questions survey. Under the directorship of Fabienne Goux-Baudiment (head of the proGective Research Centre for Futures Studies in Paris) we will be offering a European Master’s Course combining foresight and innovation. Managing change and thinking differently are activities that figure prominently; action learning is employed, and after a first year, the third semester is with a European partner university. Participatory visits to corporate ‘futures labs’ are included. To quote from the summary: “Consistent with the new generation, teaching will be interactive, employing the latest technology and the best in pedagogy. New systems will attract the tech-savvy. Classic academic fields will be renewed, and an interest in the European multicultural model will be cultivated. High-level professors from top schools are being recruited.” Among the teachers are – apart from Fabienne Goux-Baudiment herself – Thierry Gaudin, Wendy Schultz, Jim Dator, and Natalie Dian (and many more).